Twilight Times Books is offering Book Reviewers Talk about their Craft, Mayra Calvani, editor, as a free download during Read an E-Book Week March 3 - 9, 2019. We will be offering additional free ebooks each day. Scroll down this page to access the free ebooks. Schooled in Magic by Christopher G. Nuttall. 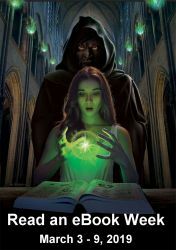 Book I in the Schooled in Magic series. Monday, Mar. 4th -- Cassie Scot: ParaNormal Detective by Christine Amsden. Book I in the Cassie Scot series. Wednesday, Mar. 6th -- Jerome and the Seraph by Robina Williams. Book I in the Gaea series. Thursday, Mar. 7th -- Monkey Trap by Lee Denning. Book I in the Nova Sapiens series. Thursday, Mar. 7th -- No place for Gods by Gerald Mills. Book I in the James Foster Adventures series. Be sure to check out the official web site for Read an E-Book Week. A number of publishers are offering give-aways during the week. For example, Smashwords is offering hundreds of free ebooks. Mayra Calvani conducted a series of interviews with 22 publishing professionals regarding book reviewing including Magdalena Ball, Judi Clark, James Cox, Lesa Holstine, Carolyn Howard-Johnson, Cheryl C. Malandrinos, Sharyn McGinty, Alex Moore, Stephanie Padilla, Andrea Sisco, Irene Watson and others. The interviews have been compiled in a free ebook, Book Reviewers Talk about their Craft. Download version -- $3.95 Free eBook! [600k] available now. Download version -- $3.50. Free eBook [700k] available now. Download version -- $3.95. Free eBook [900k] available now. Download version -- $6.50. Free eBook [340k] available March 3rd - 9th. Download version -- $6.50. Free eBook [1.2 megs] available Mar. 3rd - 9th. Download version -- $6.50. Free eBook [1 meg] available Mar. 3rd - 9th. Download version -- $6.50. Free eBook [1.2 megs] available March 3rd - 9th. Download version -- $6.50. Free eBook [1.5 megs] available Mar. 3rd. Download version -- $6.50. Free eBook [1.9 megs] available Mar. 3rd. Download version -- $6.50. Free eBook [1.4 megs] available Mar. 4th. Download version -- $6.50. Free eBook [775k] available Mar. 4th. Download version -- $5.95. Free eBook [775k] available Mar. 4th. Download version -- $6.50. Free eBook [1.6 megs] available Mar. 5th. Download version -- $6.50. Free eBook [1.4 megs] available Mar. 5th. Download version -- $6.50. Free eBook [1.2 megs] available Mar. 5th. Download version -- $6.50. Free eBook [1.7 megs] available March 6th. Download version -- $4.95. Free eBook [750k] available Mar. 6th. Download version -- $6.50. Free eBook [640k] available Mar. 6th. Download version -- $6.50. Free eBook [3 megs] available Mar. 7th. Download version -- $5.50. Free eBook [1.1 megs] available Mar. 7th. Download version -- $5.95. Free eBook [1.1 meg] available Mar. 7th. Download version -- $3.95. Free eBook [900k] available Mar. 8th. Download version -- $6.50. Free eBook [1 meg] available March 8th. Download version -- $6.50. Free eBook [1 meg] available Mar. 9th. Download version -- $6.50 Free eBook! [1 meg] available Mar. 9th. More books by D. M. Nigro available Mar. 9th. Download version -- $3.50 Free eBook! [2.5 megs] available now. TT Books will accept payments in international currencies such as United Kingdom pounds sterling, Canadian dollars, Euro dollars and Japan Yen in addition to U. S. dollars via Pay Pal. Please specify which book you are ordering and your preferred format. Downloads are available in PDF and HTML formats. Copyright © 1999, 2000 - 2019. Lida E. Quillen . All rights reserved.